The highly capable staff, including night security, all contribute to a carefree holiday. Mango Bay is conveniently located in St. James, between Holetown and Speightstown, with the closest hotels being Glitter Bay and the Royal Pavillon just a five minute drive away. The world famous Sandy Lane, Royal Westmoreland and Apes Hill golf courses are also within a short drive. 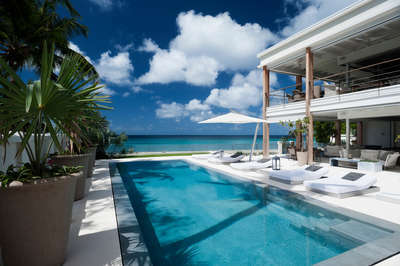 Please note that the owners master suite is only available on request and when the house is booked as a seven bedroom. Christmas and New Year rates are not available, please contact a villa specialist for more information. ADSL internet connection and fax machine.